The siren wailed through our space ship. I jumped up. "The Captain needs us!" I told my sister Roa. "We'd better hurry to the deck." When we reached the Captain's deck, that tiresome alien Belinda was already there. She was shouting at my beloved mother and father. "Well?" she bellowed. "What did they say?" My dear parents looked worried. My father's purple fur was quivering. My mother's tentacles were trembling. I asked my father, "What is the matter, oh brave Captain? Is the ship in danger?" "Oh, no! Nothing like that. We've just had some wonderful news," said my father dismally. "A message from Belinda's parents," sighed my mother. "Belinda doesn't have to go home yet. She can stay with us..."
"...just as long as she goes to school." "No!" roared Belinda. "No, no, NO! I hate school!" She stamped her feet. "Dear Belinda-" my gracious mother began, but Belinda kept shouting. "I'm not going to school! Anyway, I can't. We're in the middle of the Duck-head Nebula. There are no planets here! Nothing but dust." "But there is a Space Station, and it has a school," said my wise father. "You might like Space School." "I don't like any school!" "Lots of aliens go to Space School," said my father. "I'm sure they'll make you welcome." I snorted. "Not likely!" Who would welcome Belinda? She was a weird-looking alien, with arms and legs as stiff as sticks, and not a single tentacle. But that wasn't the real problem. The real problem was how loud she was - and how bossy. Now Belinda glared at me. "What did you say? Not likely?" Then I realised something. If Belinda went to school, she wouldn't be here, bossing us around! So I quickly said, "I meant you won't just like Space School, Belinda - you'll love it! Space School is brilliant! You get to float around the classroom!" She looked grumpy. "Will it have a naughty chair?" "No, no," I said, although I had no idea what a naughty chair was. "It will have lots of happy chairs!" "Well..." She paused. "Maybe I could give it a try." I almost cheered. No more Belinda following me around the ship! Now I could spend more time playing with my secret friend. My brave father looked relieved. "Excellent!" he said. "You needn't worry about being lonely, Belinda - because you'll all go to school together." "You've missed a lot of lessons," my mother told me. "Tomorrow, all three of you charming and obedient children will go to Space School." "Hooray," I muttered. It was all right for my sister. For some strange reason, she liked Belinda. My new friend was a Niffity. But when I went to tell it about school, I couldn't find it. This was not surprising - because the Niffity was invisible. I had found it on a spooky spaceship we had visited a few weeks earlier. The Niffity had followed us back to our own ship. Nobody knew it was here but me. It was living at the far end of the ship. Every day I smuggled food to it. I taught it our language, and we played games. My favourite game was teasing Belinda. I got the Niffity to move things around the spaceship, so that she would think that it was haunted. But Belinda didn't get scared. She just got cross. She accused me of playing tricks on her - although she couldn't work out how I was doing it. Today I had some blue mould muffins for the Niffity. I tiptoed down to the far end of the ship. "Niffity!" I whispered. "Where are you?" The Niffity had no eyes, so it couldn't see. I hoped it could hear me. There was no answer. I put the muffins down, and felt around for it. The Niffity had a soft, squidgy body like a jellyfish, which kept changing shape. "We've got to go to Space School tomorrow. I won't be able to come and see you. Not that I ever can see you... but I'll bring you some food in the evening." As I plodded back to my cabin, I felt a bit sorry for the Niffity, because next day it would be all alone. Our delightful mother took us there in the shuttle. I looked out at the Duck-head Nebula. Belinda was right - there were no planets here, just a huge cloud of dust drifting through space. It wasn't only dust, though. There were some big rocks floating around. My skilful mother dodged one or two before she pulled up at the Space Station. The Space Station looked like a giant starfish made of enormous tubes. The tubes were greenhouses to grow food. Attached to them were a shop, a hospital, a library - and right at the end of one tube, the school. There were about thirty children in the classroom. Some were painting, some were writing, some were hopping and a few were flying. Half of them had proper fur and tentacles, like me. A couple were creepers with a hundred tiny legs; three were scaly hoppers, and some were scarlet flyers with glossy wings. But none of them was as funny-looking as Belinda. They all stared at her as she walked in. Belinda scowled back. "I thought you said they'd be floating around!" she grumbled. "They are - sort of," I said. I jumped up in the air to show her. I went half-way to the ceiling before I slowly drifted down again. I wasn't exactly floating, but I felt very light. "There's only a little bit of gravity here," said my wise mother. "So we don't weigh much." Roa jumped up too, and drifted down. "We make lots more gravity on our starship," she said. "We're used to feeling heavy," my mother explained. "But many of the aliens here aren't used to gravity. It's bad for them. So the Space Station makes a bit of gravity by spinning round - just enough to stop everything floating all over the place. That's why you can jump and bounce." "Bother," said Belinda. "Bouncing is no fun." "Good! You're not here to bounce," growled a deep voice behind us. "You're here to learn." We turned round. 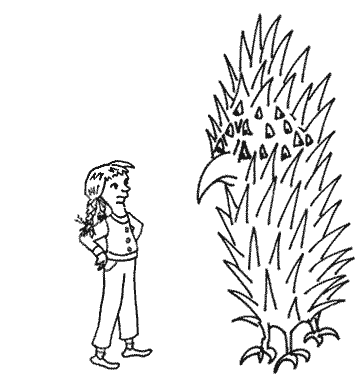 Towering over us was a fearsome creature covered in sharp grey spines. It stared at us with piercing red eyes. It had eyes all round its head, gazing at different parts of the classroom. "I am your teacher," announced this scary-looking alien. 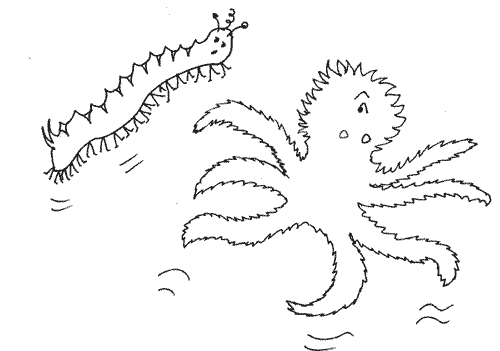 It shook its spines with a loud rattle, and the class fell silent. The teacher glared at us. "Everybody sit down, lie down, or hang from the ceiling. It is time to start our lessons." Belinda pulled a sulky face. I didn't feel too happy either. This teacher looked very fierce, and very prickly. "Dear Mother?" I whispered. "I think I've changed my mind..."
But our dear delightful mother had just left. I sat on a bench with Roa and the other furry children. The creepers and hoppers lay down in front of us. The scarlet flyers fluttered to the ceiling and hung there upside down. Belinda was at the back. When I turned round to look for her, the teacher's spines rattled loudly. "Face the front! I am Miss Glod," boomed the teacher. "And you are?" I stammered my name. Roa squeaked hers. But Belinda said, "I am Professor Belinda Henrietta Montague de Clancy, and I am extremely clever." "I didn't know she was a Professor!" whispered Roa. "She's not," I whispered back. "Quiet!" snapped Miss Glod. "Clever or not, you new children need to take a test, to see how much you know." She gave us each a screen. As I stared at mine, questions began to appear on it. "Help!" I muttered. "I don't know the square root of 65! Or how many noses a Paradiddle has! And where is the Sudden Solar System?" Roa was busy answering her questions. But I didn't know the answers to any of mine. Quickly I glanced round for Belinda, but I couldn't see her. "Keep your eye on your own screen," said Miss Glod sharply. I felt miserable. I wished I was back on my spaceship, chatting to the Niffity! Suddenly there was a loud clang. Everything lurched sideways, as if a huge, heavy hand had given the classroom a shove. I slid off my bench. Roa fell on top of a hundred-legged creeper. Some of the flyers tumbled down from the ceiling. As soon as they landed on the floor, they took off again, and went up into the air. But they weren't flapping their wings. They were just floating - and looking very surprised. What was more, I was floating up into the air as well! I tried to grab hold of my bench. But the bench flew up into the air beside me! Roa was floating just above my head, her tentacles all waving madly. Paint-pots and screens and coats and lunch-boxes took off into the air. Other children flew around me. We bounced off the classroom walls and bumped into each other. None of us could stop ourselves. The creepers waggled their legs helplessly. When the flyers tried to flap, they crashed into the ceiling. As for the hoppers, they were all squealing with shock. Miss Glod floated past me, frantically rattling her spines. "We've lost all our gravity!" I said. "But why?" "We've come uncoupled!" cried Miss Glod. "We're drifting away from the Space Station!" I twisted in mid-air to look through a porthole. Miss Glod was right. There was the Space Station, slowly spinning. We weren't attached to it any more. It was getting further and further away. With horror, I realised what that meant. "We're in a runaway classroom!" I exclaimed. "We're adrift. Soon we'll be lost in space!" "How can it have happened?" gasped Roa, as she floated past me. "I don't know!" I answered. But then I caught sight of Belinda - and suddenly I did know. Belinda was happily turning somersaults in mid-air. "This is more like it!" she said. "This is what I call a space school! This is fun!" I grabbed her with a tentacle. "Belinda? What did you do?" "I just happened to pull a lever," said Belinda with a big grin on her face. "I wasn't to know it would set the school-room free." "But we're drifting out to space!" I cried. She shrugged. "We won't drift far," she said. "They'll send a ship to come and rescue us. Until then, I'm going to enjoy myself!" And she began to try and do cartwheels on the ceiling. "I'm not enjoying myself!" I wailed. I was feeling space-sick. I didn't know which was the right way up any more. I wasn't the only one. The creepers were whimpering, and the hoppers had turned green. "Miss Glod! When will it stop?" begged one. "Is somebody coming to rescue us?" squealed another. Miss Glod didn't answer. She was busy swimming through the air until she reached the intercom. She spoke into it. Her spines rattled sharply. When she faced us she did not look pleased. "The rescue ship is busy right now," she said. "We'll have to wait." "But what's it doing?" asked Roa. "Why can't it come straight away?" "There's a dust storm passing through this part of space," replied Miss Glod. "It's damaged some shuttles. They need rescuing first." "I can see the dust storm!" I cried, gazing through the porthole. "We're heading straight for it!" "So what?" said Belinda, bouncing off the ceiling. "It's only dust. Dust won't hurt us." I stared through the porthole. I did not like what I saw. "It's not just dust," I said. "There are rocks as well - and some of them are really big!" Before I finished speaking, there was a THUD. The school-room rocked. I collided with a flyer. "Sorry - I couldn't help it." Next minute another THUD sent a hopper crashing into me. THUD! THUD! "We're being hit by rocks!" cried Miss Glod, her spines clattering. "Everyone find something to hold onto!" We tried. But we were being thrown around the classroom like pebbles in a tin. "Ouch!" cried Roa as she cannoned into the wall. "Eek!" cried Miss Glod as she hit the ceiling. I was tossed against the other wall. "Ouch," I said, before I realised that it hadn't really hurt. "Niffity?" I whispered. "Is that you?" I heard the Niffity's soft voice close to my ear. "I followed you," it said. "I thought I'd like to go to school, so I hid in your shuttle. I've never been to school before. Is it always as exciting as this? THUD!! That was the loudest one so far. A second later we heard a strange, thin, hissing sound. Miss Glod's spines rattled faintly. They had turned pink with terror. "It's the air leaking out," our teacher gasped. "That rock just punched a hole in the classroom wall!" The hissing noise came from the front of the classroom. I could see a small black hole. "Help!" cried Roa. "Soon we won't be able to breathe!" "We need to plug the hole," I said. Until the book or bottle or paint-pot crumpled up and was pulled right through the hole into space - and then that dreadful hissing started up again. It sounded like someone taking a long, deep breath - sucking all the air out of our classroom. Miss Glod threw a screen at the hole. That blocked it for a few seconds, until it shattered into bits. The pieces were sucked through the hole and had gone. Miss Glod's spines began to ping out of her skin, one by one. Each of them shot towards the hole and was sucked outside. "What's she doing that for?" said Belinda. "She's not doing it on purpose," I said. My fur was shivering. "We're all going to get sucked out soon!" "We've got to do something!" Roa cried. "Find something to plug the gap!" "How about Belinda?" I muttered. Miss Glod was doing her best. Next she threw a coat over the dreadful hissing hole. It worked for a moment. Then, with a hungry SHLOOP. the hole swallowed it and began sucking out the air again. "Help!" said Roa suddenly. "I'm being sucked towards it!" I grabbed onto Roa with three of my tentacles. I twined two more around Belinda's bony arms. With my last two tentacles, I grasped a pair of coat hooks on the wall, and hung on grimly. But I could feel the pull of that greedy, sucking hole. It was getting harder to breathe. Soon all the air would be sucked out - or else we would! "Hold on, everybody!" cried Miss Glod. But I heard despair in her voice. Then I felt something rush past me - something that I couldn't see. Suddenly, the hissing stopped. We all stared at the hole, waiting for it to start again. It didn't. Yet we could still see the hole, with black space on the other side. "Why aren't we being sucked out?" asked a creeper. "Something must have blocked it," I answered, puzzled. "Something invisible." Then I realised what that something had to be. The Niffity! "Niffity!" I shouted. "Is that you? Are you all right?" I heard its soft, squidgy reply. "I'm fine. I'm just blocking up this leak for you." "But you'll get sucked out!" I cried. "Oh, I'm all right for now," said the Niffity. "I'll just stay here until the rescue ship comes." I pushed off from the wall and floated across the classroom to reach it. I could feel the Niffity's body stretched over the hole. It didn't feel squidgy any more. It felt as tight as a balloon. I'd forgotten I was still holding Belinda. She had floated over too, and now she said, "Who are you talking to? There's nobody here!" "Yes, there is," I said. "It's an invisible Niffity that was on our space ship." "Invisible?" Her eyes grew wide. "So that's how you played those tricks on me! You fraud! You fuzzball!" She seized a pot of paint and tried to throw it at me. Little globes of paint began to wobble through the air. "Stop it!" said Roa. "We're still in terrible danger!" "Belinda got us into it," I said. "Pooh," sniffed Belinda. "It's not that bad now." "Yes, it is! We don't know how long the Niffity can hold out!" "I'm quite strong," said the Niffity's voice. "Space is stronger," warned Miss Glod. "Sooner or later, the vacuum of space will pull you through that hole." "No!" I cried. "It mustn't! We have to get back to the Space Station before that happens!" But when I stared out of the porthole, the Space Station looked further away than ever. What was worse, we were heading for more rocks - and one of them was enormous. Miss Glod looked too. A dozen more spines fell out as she exclaimed, "Oh, no! If we hit that huge rock, we'll be done for!" "Can't we steer away?" begged Roa. "This school-room capsule has no engine," groaned Miss Glod. "It needs something else to push it." I stared out at the huge rock hurtling towards us. "Brace yourselves!" I shouted. "We're going to hit it any minute now!" "Don't worry," said Belinda. "We'll be fine." "Fine? We're just about to crash!" I couldn't bear to look. I tried to shield Roa with my tentacles. But there was nothing I could do to protect the Niffity. I'd never heard a sound like it. The whole schoolroom clanged like an enormous gong. We were all thrown forwards at the wall. "Ow!" said the wall. "Ow ow ow ow ow!" as children crashed into it and bounced off. Thanks to the Niffity, none of us got hurt. But next minute we were tossed around the classroom like rags in a washing machine. I tumbled over and over. I couldn't stop myself. The whole classroom was spinning round me. I crashed into benches and smashed into walls and got spattered with paint and prickled with flying spines. It seemed to go on for ever. The Niffity wasn't the only one going "Ow ow ow!" All the children were shouting as they shot around the classroom. At last the spinning slowed down. Feeling dizzy, I clutched on to a passing hopper. Together we made our way to a porthole. We peered out fearfully, expecting to see more rocks ahead. But we saw something quite different. Both my mouths fell open. "Hey!" said the hopper, amazed. "That's the Space Station! How did we get back here?" "We must have hit that rock so hard that it knocked us all the way back!" I said. There was another THUD on our hull. This time, it wasn't a rock. We had just touched the Space Station. "We're safe!" cried Miss Glod, who had hardly any spines left by now. "Well, of course we're safe!" snorted Belinda. "I knew all along that would happen." "No, you didn't," I argued. "You-"
Hearing a groan, I stopped. I'd forgotten about the Niffity. Guiltily I hurried over to it. It was splattered with paint, and had spines sticking into it. "I don't feel very well," it moaned. "Hang on," urged Miss Glod. "The crew will wrap a shield round our classroom to block that hole. Then they'll get us out of here!" All the other children cheered - except Belinda. She looked grumpy. "Bother," she said. "That was fun. I don't want it to stop." I didn't cheer either, because I was worried about the Niffity. I stroked its tightly stretched body and pulled spines out of it. A few minutes later we heard a scraping sound: that was the shield being wrapped around our hull. At last the Niffity could move away. I put out my tentacles to help it. It felt even wobblier than usual. "Well done, Niffity!" I told it. "You saved us all." "Indeed you did," said Miss Glod. "How can we reward you?" "Could I come to school again tomorrow?" asked the Niffity shyly. "Certainly," said Miss Glod. I was delighted. I wouldn't mind going to school with the Niffity! Miss Glod began to fix spines back in her skin. "Tomorrow, however," she said sternly, "things will be back to normal. There will be no more floating round the classroom." The airlock opened. Children began to troop out of out the messy classroom into the Space Station. I looked at Belinda. "I don't suppose you'll want to come to school tomorrow," I said hopefully. "It won't be any fun. Miss Glod is really strict." "She is, isn't she?" said Belinda gloomily. Hooray! I thought. Belinda won't come back to school tomorrow. I've won! But a squidgy voice beside me said, "Everyone should go to school, Professor, even very clever people like you." "Really?" Belinda looked pleased. Then she looked thoughtful. "Niffity?" she asked. "How far can you stretch?" "Ooh, a long way. I can grow tentacles as long as I need," it said. "So could you reach across a classroom with them?" "And pull spines out of a teacher's skin?" "NO!" I cried in horror. "No, Belinda! No, you can't!" But Belinda began to smile. "I think school will be brilliant tomorrow," she said. "Especially with the Niffity sitting next to me!" Click here for Kindle (mobi file) or click here for Kobo, Nook etc (epub file).